For all of you fans out there, it's back! Just announced that Fox picked up the show, after ABC abruptly cancelled it last year! I'm on board. 'bout time somebody woke up. Money to be made here. Number 2 sitcom on ABC when it was cancelled. Congrats and thanks FOX. A lot of theories out there as to why ABC cancelled. Despite the fact it was a money maker. Ideology of the ABC executives the most prevailing. No mystery, they didn't like the conservative view points--even in comedic fashion. Looks like the entire cast is back! LOL. Lunatic fringe conspiracy theories about a TV show. Someone has been in the San Diego sun too long. Good Show! I'm glade they're back in biz! Great show, glad to see it back. Far better, IMO, than Home Improvement. I loved Home Improvement, but Last Man Standing had topics that were more ideology based, much to the chagrin of the studio executives. That was a bonus, IMO! Update - Re-booted show is a hit! Ohh I forgot to watch, Ill check the on demand. I want to watch it also. Thank you FOX for bringing it back. Now get Roseanne and start another show where her family is on vacation somewhere else and it's her and a new cast of neighbors and friends. Heck, maybe a neighbor of Tim Allen. 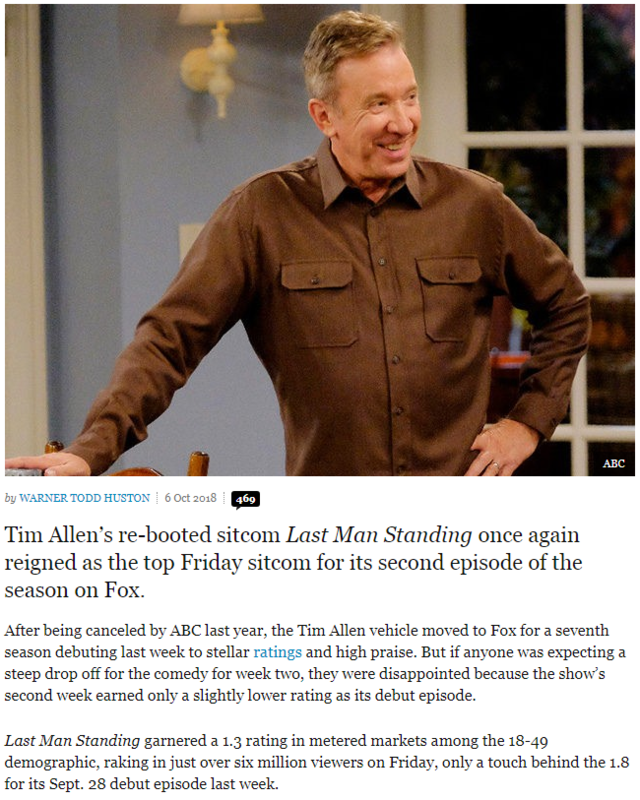 Tim Allen, making TV great again. Bravo!!! Roseanne has proven that her kind of offensive humor is best left inside her home. Yet any liberal comedian can and do say whatever they want and it is ok? If you do not like it there is a multitude of channels to hop over to. This is what makes America GREAT ... a choice!! If it gets low ratings it disappears plain and simple. I agree with you 100%, however racism should never be an option. Your opinion and mine. Great show ,glad they rebooted it. Ya know what offends people the most is when the truth and reality hit close to home. If it didn't then there's no reason to be offended. Even the Fox promo is funny! Takes a jab at the previous network! Looks like my post hit a little too close to home for rooftop.